This quote, snatched far out of context from a tense scene of The Great Gatsby, makes its rounds every September. And while I agree, as much a lover of fall as any girl who likes sweaters, hot drinks and orange leaves, for me it would be more accurate to say “Life starts all over again when I cover the bulletin boards with a new color of paper.” Or “Life starts all over again when I spy notebooks on sale for $.50 at Office Max.” September is a beginning again, a year “fresh, with no mistakes in it,” as another fictional teacher, Anne Shirley, would have said. Whether I was opening a fresh box of home school books, unlocking a new locker at Ballard High School, or rewriting my name on the board at the front of my classroom, September has always meant that even though I got a C in pre-algebra last year, or fought with my sixth period students every day, this is a new year. This September, for the first time in 25 years, I’m not going “back to school.” Oh, I’m learning. But instead of purchasing school supplies I’m registering for bottles and swaddling blankets. Instead of arranging desks, my husband and I are struggling to set up a second-hand bassinet, which came to us in great condition, but with no instructions. Instead of planning curriculum, preparing for my students’ first day of classes, I’m writing a birth plan, preparing for Luci’s arrival in November. It’s another kind of new year. 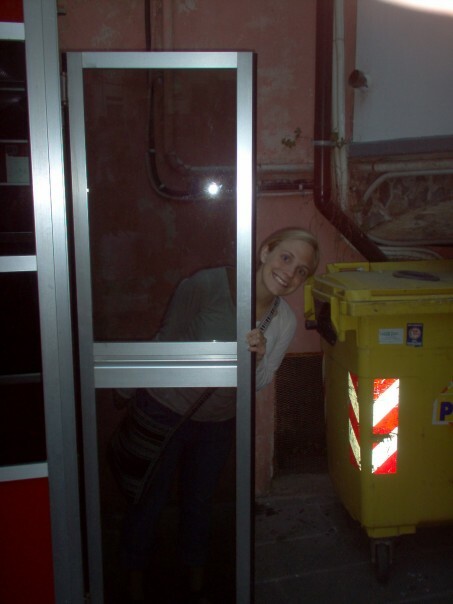 I interviewed for my first teaching job from this phone booth. And in the midst of this new year, I’m feeling nostalgic. Not simply because I’m not there, swimming in the sea of details and dreams that a new school year entails, but because I became a teacher exactly ten years ago. To be precise, I started my student teaching internship at Ingraham High School a decade ago, nervous and uncertain yet armed with a vague determination to “see it through” and bolstered by a pragmatic and grace-filled mentor. Though days and years since have blended together into a two-toned mural–public and private, urban and rural, secular and Christian–those early moments are still vivid. I remember their faces and voices, those ninth graders, fourteen-year-olds from Somalia, Vietnam, the Philippines and Cambodia, who made me a teacher, those many years ago. Before them, I wasn’t sure I wanted to teach anymore. After them, I did. 150 ninth graders changed–or at least cemented–the course of my life. Those first days of teaching, both as a student teacher and the following year when I set out on my own, are perhaps the best analogue for my heart and soul this summer. To look ahead into the mystery of parenting and all we don’t know of this silent, wriggling person inside of me, I’m looking back. 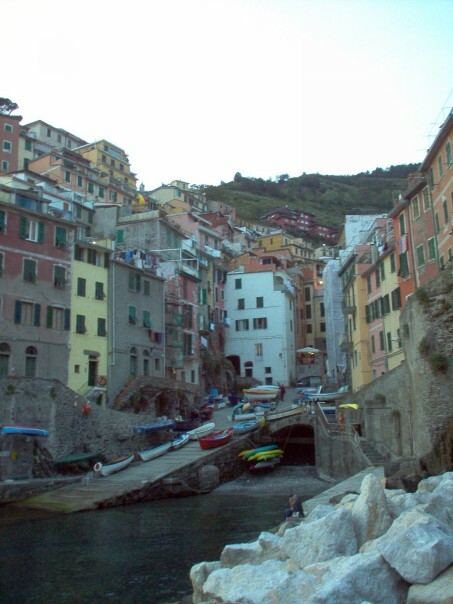 Back to the evening I interviewed for my first real teaching job at Ingraham, from the pay phone by the harbor in Riomaggiore, Italy, where I’d gone on vacation from a study-abroad trip to England. I was sunburned, wearing a swimsuit under my linen pants, my hair still in braids from our day at the beach. When the line went blank, nine time zones away, I’d been offered a job. I started the call as an English major and ended it as a professional teacher. 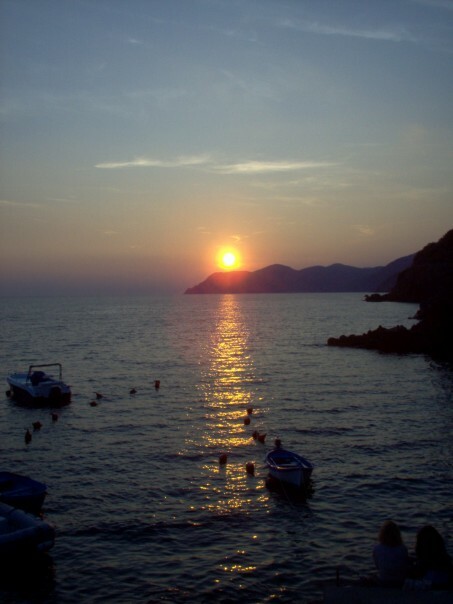 I’d crept back to the rocks where my friends sat, watching the sunset, drinking wine and eating sun-warmed pesto on fresh Italian bread. As surely as the sun was disappearing behind those rocks ahead, I realized, this would end. Not just a perfect trip, but the whole season, a marvelously chaotic four years that had been rich in learning and light on responsibility. I didn’t know then that there would be other trips to Italy, nor did I suspect how much learning I’d keep doing forever. I thought I’d just grown up. Standing in the doorway of “real” adulthood, whatever that is, I knew it was a one-way journey. And I that was leaving a particularly pleasant room. It’s still a doorway. Not a closed door–God willing, I’ll return to teaching a year from now–but still a doorway, from a familiar room to a brand-new one. More than anything, this summer I’m remembering when teaching was the new room. Or further back, when it was college, or high school. There’s always a familiar place, where I can find my way around with my eyes closed, and a wild new one to explore. And just as it did ten years ago, the way forward takes both courage–holding my breath and trusting that the same God who brought me this far will stick with me–and infinite gratitude. For the places I’m leaving behind, even if just for a while. For the places I’m going. For the students I’ve taught and don’t teach at the moment. And for our little girl, so close to me and still three months away.